We loved the last ‘Neon Surge’ boot pack from Concave. The black, yellow and white colourways were fresh and vibrant, but weren’t too garish like some other neon colour schemes we’ve seen this year. We know we’ve got a lot of fancy dribblers out there that like to deliver a little flare to their game, and having your boots stand out is the first step towards stealing the spotlight. It seems that Concave know that. They’ve been constantly delivering designs for their Volt+, Aura+ and Halo+ boots that push the limits on colour. The lightweight Volt+ has been a favourite for bursting past defenders and for causing relentless danger for the opposition. They are lightweight and minimalist to give a barefoot feel on the ball. The Volt also features a Concave Component that sits on the upper part of the laces for a larger sweet spot; delivering devastating power and pinpoint accuracy. The Techstitch outer has been recoloured with a yellow toe box that blends into a zest coloured heel. The logo is plain white with black rims to stand out against the atomic knit and the neon yellow laces and Concave Component; they’ll see you coming, but they still won’t be able to stop you. The technical Aura+ (with premium calf leather upper for natural ball feel and laser guided accuracy in passing) has been given a make-over which we love. The entire burgundy outer gives the boots a real classy and unique look about them. To counter the deep red, the inner lining has been stitched in black for a dark contrast and to maintain shape. A complete white logo on the outer foot completes the new colourway. The Halo+ sleek new design in ‘patriot blue’ with a lighter blue graphic stands out beautifully on the pitch. The inclusion of the mixed zest and patriot blue coloured Hybrid soleplate and orange edging on the logo complete the look for boots designed to take control of the game: physically and visually. Are you feeling the new Atomic colourway? 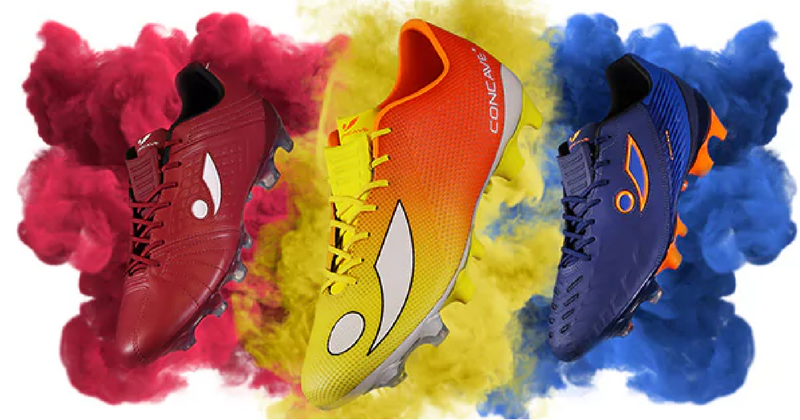 Let us know what you think of the new Concave football boots in the comments below! If Borussia Dortmund made football boots, they’d probably look something a little like this.